1 big thing: The global economy's "delicate moment"
The IMF lowered its growth forecast yesterday for the third time in 6 months to its lowest projection since the financial crisis. "A year ago, economic activity was accelerating in almost all regions of the world. One year later, much has changed," Gita Gopinath, IMF's economic counselor and director of research, said at a press conference on Tuesday. "This is a delicate moment for the global economy." Yes, but: Lagarde and Gopinath have made a point to say that they don't see a recession in the near term, and they expect growth to pick up in late 2019 and in 2020. Yes, but, but: The IMF's rosy future economic projections rely on politicians avoiding "costly policy mistakes" and working cooperatively. Globally, politicians have been doing just the opposite. Watch this space: Asked by Axios during Tuesday's press conference how the IMF factors growing political dysfunction and the fact that central banks this year have had to add more stimulus rather than begin normalizing interest rate policy, Gopinath dodged. "It is indeed the case that we have to look forward and see how this plays out," she said. The IMF's prediction of 3.3% global growth in 2019 still relies on a lot of optimistic assumptions. "If the downside risks do not materialize and the policy support put in place is effective, global growth should rebound," said IMF's Gita Gopinath. The 3.3% estimate is down from estimates of 3.5% in January and 3.7% in October. All of the world's developed economies, including the U.S., and most major emerging-market economies saw a write-down in their outlook. "It is important to keep in mind that we still live in an environment with high levels of public and private sector debt, so there are financial vulnerabilities that are still there and still building up," Gopinath added. Thought bubble from Axios' Sara Fischer: Analysts don't expect Sony to bow to Third Point's pressure to sell Sony Pictures this time around, especially given that the firm will have even less leverage now than it did when it first pushed the Japanese giant to sell Sony Pictures in 2014. Crude oil prices look to be decoupling from oil and gas supply again in 2019. Brent, the global benchmark, is trading above $70 a barrel on international markets. Supply cuts from OPEC and major producers like Russia have driven a 30% rally in Brent crude prices this year, despite fears of an economic slowdown and a strong dollar, which typically weighs on the value of oil. The big picture: The run-up in prices so far comes despite global discoveries of oil and gas reaching 3.2 billion barrels of oil equivalent in the first quarter. Most of the gains were recorded in February, when 2.2 billion barrels were discovered — the highest since August 2015, Rystad Energy said in short note. Quick take: The big finds are another sign that fears of a crude supply crunch opening up by the early 2020s likely won't come to pass, Axios' Ben Geman writes. But 2019 is set to be third straight year of upstream investment increases, per the International Energy Agency. What's next: "[T]he push for substantial new discoveries shows no signs of slowing down, with another 35 high impact exploration wells expected to be drilled this year, both onshore and offshore," Rystad said. 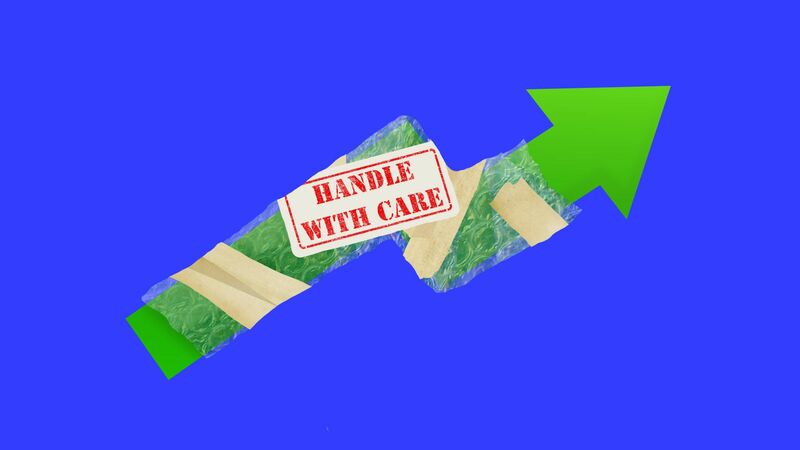 But, but, but: "Forecasts of a supply gap persist, but they’re being pushed further out into the future," Bloomberg reported in late January, and the IEA has warned against complacency. The Nasdaq is recommending regulatory reforms to the SEC, including a change to rules that could impact smaller public companies, investors' access to market data and the cost of trading — all of which, the exchange says, could spur more innovation, Axios' Courtenay Brown reports. Background: SEC chairman Jay Clayton, a 2017 Trump appointee, has taken a harder line on stock exchange practices in the "interests of America’s retail investors" — most recently by trying to implement a controversial pricing program that's since been halted while a judge decides whether to take up a lawsuit by NYSE, Nasdaq and Cboe Global Markets to block the initiative. Change how investors are charged for market data by how often they use it, instead of pricing it by what they do. Currently, brokers and other professionals are charged differently than retail investors, regardless of how often they trade. Allow smaller companies the choice to centralize trading on 1 exchange, instead of being spread across other markets and venues. But, but, but: Don't expect immediate action (if any) by the SEC, which tends to move slowly. Example: The Nasdaq unveiled a slate of reform proposals in 2017. The SEC has held hearings on some of the issues, including on the hotly debated market data pricing, but made no final changes to current rules. Having a higher velocity of money usually means a country is further along in the business cycle and should have a higher rate of inflation. "If the velocity of money is increasing, then more transactions are occurring between individuals in an economy," notes the St. Louis Federal Reserve. 6. 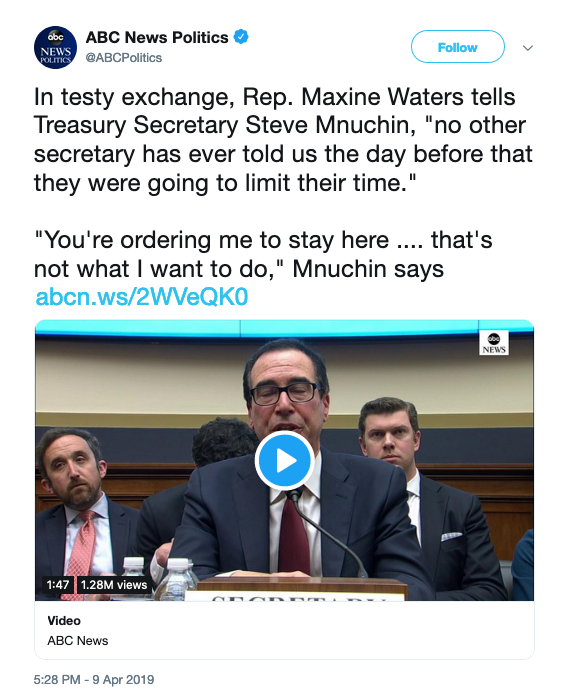 "Please cancel your meeting and respect our time"
There was a bit of a misunderstanding between Treasury Secretary Steve Mnuchin and Rep. Maxine Waters, the chairwoman of the House Financial Services Committee, yesterday. Waters: "As I have said, if you wish to leave, you may." Mnuchin: "If you'd wish to keep me here so that I don't have my important meeting and continue to grill me then we can do that. I can cancel my meeting and I will not be back here. I will be very clear. If that's the way you would like to have this relationship." Waters: "Thank you! The gentleman, the secretary, has agreed to stay to hear all the rest of the members. Please cancel your meeting and respect our time." It went on like that, and it ended spectacularly.